Basement Design Studio | Make it a night IN at the movies! As the leading independent basement design specialists you can imagine we deal with hundreds of enquiries a year. Many basements projects are undertaken in order to create a bit more room for the family or perhaps a nanny or elderly relative needs to move in. The spaces are functional and out of the way but can also become one of your favourite places in the house. Almost without exception we are asked about home cinemas and whether a basement space can be dual purpose, for example a playroom by day and a cinema room by night. We get all sorts of interesting requests – the answer is usually the same… “Anything is possible”. So we’re going to take a look at some of the best ways to bring the movies home with you and enjoy the latest offerings from Hollywood in the comfort of your own home. Once you’ve found the location for your home cinema, make sure you consider sound insulation in the walls to create a sound barrier and avoid disturbing neighbours or other people in the house. This will keep the sound within the room and add to the whole cinema experience. If you are soundproofing the walls, now might be a good time to hide any wires you have dangling from your devices which could spoil the illusion and generally look a bit messy. Make sure you cater for all aspects of your room, this includes wires for lighting, sound, projectors and screens – hid it all away. Sound systems are complicated. What’s best for your room? A multi speaker set up, sound bar or complex surround sound. It’s not just about your set up either – your décor will impact on your sound. Carpets and fabrics help contain sound and prevent echo so make sure your décor is plush. Bigger isn’t always better. There are loads of options when it comes to your viewing platforms but most fall into two categories – screen or projector. Take into consideration the dimensions of the room and make sure whatever you choose has the latest 4k technology and can be linked to Blu-Ray and Games Systems (for the kids obviously). Consider setting up a central control system to avoid that irritating search down the side of the sofa for the remote control. You might choose to configure a universal remote control, iPad or iPhone or even install a home automation system to take care of everything: lights, sound and vision – the possibilities are endless. There are so many different things to consider when installing a home cinema the world really is your oyster; basements have proven a popular location for them as often the lighting is fully adjustable and they can be made cosy for a night in front of the screen. 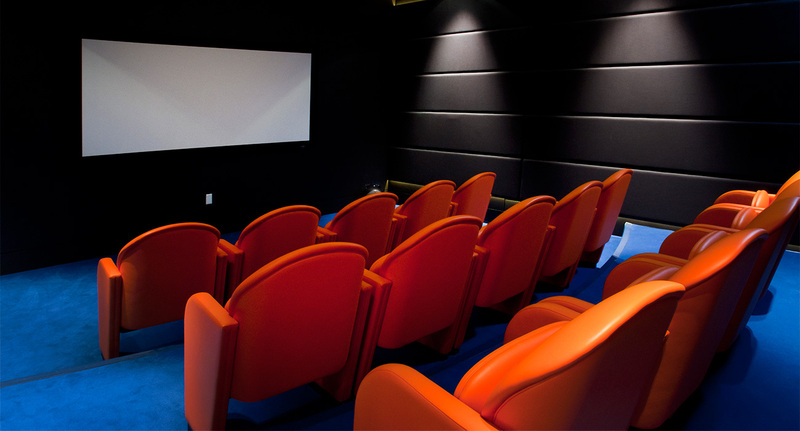 Take a look through our gallery to see some of the home cinemas we have had installed in our basements. If you are thinking about a basement project or extending your property this year make sure you give us a call. We are the leading specialists in basement conversions and design. You can call us on 01628 826066 or email us. You can also follow us on Facebook, Twitter, Instagram and LinkedIn for all the latest updates.